Plot a Course for Adventure! 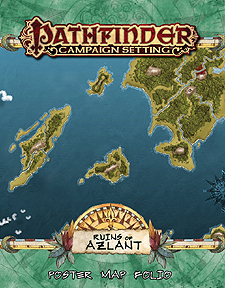 Explore the ruins of a shattered continent, the fabled lost Azlant, with the Ruins of Azlant Poster Map Folio. Pore over masterful cartography and plan exciting adventures with these three massive poster maps designed for use with the Ruins of Azlant Adventure Path. These huge, lavishly illustrated poster maps depict major locations found in the Ruins of Azlant Adventure Path. The first map is a player-oriented nautical map of the islands in the region of broken Azlant, where the campaign unfolds. The second map depicts the underwater town of Talasantri, and the third map, labeled to assist Game Masters, shows the islands that make up the setting for the Ruins of Azlant campaign. Whether you're looking for a group of remote islands rich for adventure, player handouts, or an exotic aquatic locale, these beautiful maps are the perfect resource for the Ruins of Azlant Adventure Path or any fantasy campaign.